For the Thanksgiving weekend, my friend Maureen asks me to join a gathering of her mother, her dog, her sister and the husband of her sister on Amelia Island. Our stay is pleasant. Amelia Island is located at the northeast corner of Florida-32 miles northeast of Jacksonville. The name comes from Oglethorpe, who bestowed the island in honor of Princess Amelia, the daughter of King George II. It is the only location in the U.S. that has been under 8 flags: French, Spanish, British, Patriots, Green Cross of Florida, Mexican, Confederate, and U.S. The island is 18 square miles in size (11,600 acres). It is 13.5 miles long, with a width that varies from 1/4 mile to 2 miles. The ocean-side beach is relatively wide and hard-packed sand lined with a large number of expensive, exclusive condominiums. The island contains a number of well-manicured golf courses. Our group stays at a condominium within Amelia Island Plantation, a resort golf course community. Our rooms have views of the sunrise and Atlantic Ocean, as well as sunsets to our west. I find the Plantation to be very suburban in design. The curvy roads twist and turn relentlessly in all directions imaginable. With few street names posted and no landmarks for orientation, it is the most disorienting design I have ever experienced. Upon first driving in on our first day, we immediately become hopelessly lost, and need to use a cell phone to call Maureen's sister for help in finding her. Each day on my bicycle I struggle to determine what roads to take, which direction to head and how much distance I need to travel. The Plantation is within an oak tree forest, which provides an impressive canopy. Canals, bicycle trails, golf course holes, and golf cart paths honeycomb the Plantation. On our first day, Maureen and I bicycle throughout the Plantation. The paved bicycle trails provide a very pleasant, low-energy bicycling experience. We ride out to Drummond Point Park on the western side of the island. 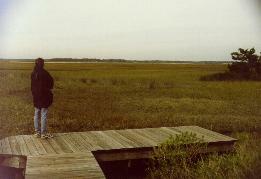 Here we find lovely wooden boardwalks and panoramic vistas across salt marshes (photo upper left). That night, for Thanksgiving, we enjoy a wonderful buffet dinner at the Ritz-Carlton. The next day, I set out for Walker's Landing and Indian Mound for a two-hour kayak trip within narrow, back-and-forth channels of a salt marsh on the western side. We spot several endangered wood storks. Our paddle trip takes us out to the Intracoastal Waterway. 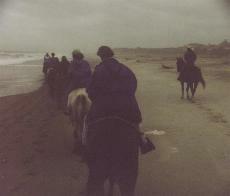 Next, we enjoy a one-hour horseback ride within wooded trails and along the beach (photo above right). I am told that my horse, Screamer, has placed second in a world "Western Pleasure Riding" competition before being "put out to pasture" to provide horse trail rides. He is very gentle and very easy to direct. At the end of our beach ride, our group has the pleasure to come upon a large adult bald eagle who is perched in a topped palm tree on the beach. Finally, we take a walking tour of Fernandina Beach (photo at left). I am pleasantly surprised by the walkable, quality urbanism this town boasts. 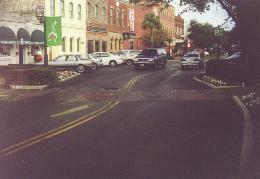 A 50-block area of downtown Fernandina Beach is listed on the National Register of Historic Places. We tour the Main Drag - the "Centre Street Historic District." For 3 blocks, intricate, historic retail and office buildings line the vibrant sidewalks full of tourists. Street trees form a lovely shaded canopy. Historic lighting and street name signs are used, and several locations feature landscaped curb extensions and bricked mid-block crosswalks-a sure sign of a quality urban experience. Topping off the quality urbanism is the on-street diagonal parking.